1. Ask about the choices the characters made at different points within the plot. Question to ask: Do you think that (insert characters name here) made a wise choice when s/he chose to (insert action the character took in a specific situation). For example: “Do you think that Alice made a wise choice when she drank from the bottle that said “Drink me”? 2. Discuss changes the characters made throughout the book. Question to ask: Was (insert characters name) different at the end of the story? Or was s/he still the same? Why or why not? For example: Was Alice different after she had gone down the rabbit hole and went on her adventure? 3. Talk about the things the characters learned. Question to ask: What do you think (insert character’s name) learned in this book? Do you think that s/he will handle things differently in the future? Example: What do you think Alice learned through her adventures in wonderland? Question to ask: What was the scariest thing in the book? Would you be afraid of that if you were in the same situation? Why/ why not? 5. Ask what part of the story they would like to live. Question to ask: If you could live through any part of that story, what would you choose? Why? What would be so fun or interesting about it? How would life be different if we could take anything out of a book and make it real? Fiction helps people to understand one another. If we read with our children, we can connect in ways that aren’t possible outside of books. The Summary was enough to pique my curiosity. It has been some time since I read a quality fan fiction and this seemed like it would fit the bill. The first two lines attracted me enough to sound like one of those quotes that people saved and read over and over again. Books and friends are always a winning combination. Kelsey is a young soldier who fights in the army. She fights 'the sorcerer' and reports to her general. But then she sees some oddities - some things that foretell a shift from her reality - her truth. From then she realises that things are not what they seem. Her quest for truth, with an odd assortment of aids and foes takes her through interesting and often revealing wonderous things. The evil sorcerer who wants power and to overthrow the king, does so by devious means. The good protagonist and her oddball team of friends understand the intention of the villain and fight him to end the war. The author has taken all the main elements of the fantasy genre, and has built up a wonderful story around it. No review would do actual justice to what the story is about. Talking about it vaguely makes the story seem generic, and being too detailed ruins the fun of the story. War of words. Armies, generals, evil sorcerers, fantasy, non human characters - this book was a riot from start to finish. The book combined magic and reality so beautifully that it put the message across without actually seeming like it was a story. The author gets special points for doing it in a fun and humorous way. The writing style is something that made me read some parts of the book more than once. I loved how the characters spoke, reacted and thought - in the way the author has penned them. I had no idea that the story was part of a series and some moments did confuse me. But the book works well as a standalone, clearly written for an age group lesser than me. I really have to thank the author for writing a book of spells, illusions, adventures, words, and everything a teen must read. This remains one of my favorite books. I loved the language, the writing style. It has never been easy to construct a make believe world so realistically. Thanks to Amy for writing a beautiful book, and I will surely read the other books in the series. I am glad I got this as a review copy! Not to be disregarded as 'yet another fantasy novel'. I received the copy in exchange for an honest review! Sikander Bansi, an unlikely political heir in Delhi, secretly records politicians in Parliament as they haggle to become cabinet ministers, bag defence contracts, dodge criminal charges and collect corporate largesse. Among them is a rising leader of the People’s Party, Nalan Malik, whose success has come through unscrupulous means. When Sikander suddenly disappears, Mira Mouli, a newspaper journalist with an unusual gift for knowing people’s thoughts, receives the controversial Parliament tapes along with clues to find him. She is attracted to Sikander’s principles and is wary of Nalan’s deceit. But her powers of knowing tell her a different story, one that she can unravel only at the cost of her life. From the bestselling author of Shoes of the Dead, this is a disturbing political fiction that reveals why Parliament functions behind gates closed to the public. 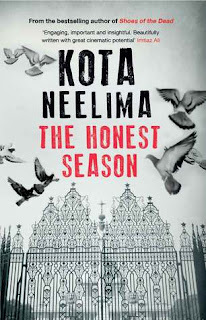 The Honest Season is a book that held my attention from the word go. The summary seemed succinct, clear and simple enough to enthrall the reader in me. I had not tried political thrillers for a long time and the good meaningful ones are hard to come by. So it was with equal parts of expectation and doubts that I picked this book up. The cover revealed nothing special, but it seemed muted and sensible, to suit the sombre mood of the story. The last line of the summary made me want to delve into the book as soon as I got the chance on the digital copy. I finished it in two sittings, over the course of a single day (today. I got the book yesterday). It take a lot of courage and proper sense to write a political thriller. And even more sense to carry it off convincingly. 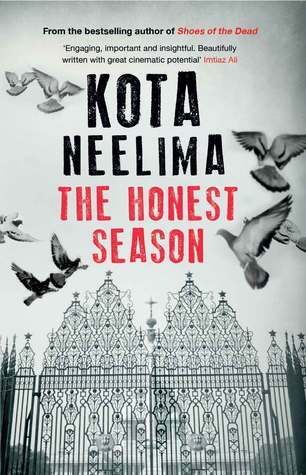 The Honest Season is a book that would make for a sensational movie. That is not the first reaction I have about books, and I am not a huge fan of books being turned into movies. To be honest I despise them, being of the opinion that they ruin the original story. But this book, if made into a book with the proper directions, this would be exciting from start to finish. Most of the length of the book is in its descriptive narrative, something I feel could have been edited out for casual readers, but they would make a good base for a thrilling movie. The story is about the parliament in Delhi and a MP doing a expose on his fellow MPs and other bureaucrats with a series of recorded conversations. Sikander Bansi is a dashing young MP with a very low profile who seems superficial at first glance. He serves his term for a little more than four years, collecting evidence and collating stories. And he goes into disappearance and releases the tapes one by one to the press, specifically to one newspaper that employs 'know journalists' - people who have special abilities to perceive the subtle layers of complexities in the human mind. He chooses Mira Mouli, a particularly talented journalist who can discern people's unspoken thoughts by merely speaking to them once. In a thrilling journey where he sends controversial content as recordings to her, each ending with a very personal, deeply affecting clue that is directed towards Mira which he claims would lead her to him. Mira struggles against the demons of her past, finding more of herself in Sikander's words and the way he seemed to easily read her thoughts. Meanwhile, Nalan Malik, an exposed MP, doggedly follows Mira, something that she finds frightening, disconcerting and strangely comforting at times. She could read the concern in his eyes but is sure he is lying. Big heads fall, and the country's political fray is threatened out of its comfortable existence. What happens next? To what extent would Mira go to uncover the truth? These and some other questions form the premise of the rest of the story. What works for the story is its narration style. I was really affected by the way the author spoke about public apathy over public property and how Newspapers were losing their relevance in the advent of media and technology. It was in her words that she weaves the magic. Sikander's first note chilled me in the way it was worded, and the clue that was directed towards Mira. I felt the connection with the author more than once while reading the book. It is amazing how much of a thrill just a few words could bring. I felt a tangible jolt when I read about the farmer Gopi, and the way he mingled with the crowd and was everything that a poor migrating farmer in urban India reflected it. The incident with the red beaded shoes and every part of the whole memory affected me deeply, and that was again because of how it was written. The words are the story's USP, the narration not slackening until the second half. What I found lacking in the story was tighter editing. Though the wordy events really increased my interest towards it, my reading speed reduced greatly in the second half because the expose was done and dusted and the reaction part of it seemed longer than the preparation leading to it. There were times when I was torn between wanting to read more of the beautiful writing and wanting to get to the end of the story quickly to make sense of it. The politically correct sardonic climax did little to satiate my thirst for a novel conclusion. But as I completed it in a single day, I realised that the story had drawn me in completely and I had fallen, hook line and sinker. Mira's skepticism regarding politics, love and everything related to life made her an interesting protagonist, one that I would be vary of but still read with interest. I loved how she responded to situations and found the meaning to the clues in her own way, resilient and strong, just how I would like a female protagonist to be. The romantic interest in the second half seemed melancholic and at times forced, though it clearly explained a lot of things in the story. Overall, a thrilling ride, and though I had a self made deadline to finish it, that was not the reason I read it in a day. The book held enough to interest me and I would take away a lot of things from this book to be stored in the recesses of my memory. Here are few gems I found and would remember for some time to come. The officer had been unafraid as he had walked back into his building, as if he knew the public wouldn’t bother if he stole from them; they never did. Yes, people would not let him get away if he had touched their homes, their furniture, their vehicles or their parking slots. But their roads, their bridges, their trains? These could be stolen from them anytime. Just like their drinking water. that 800 words of the most thought-provoking newspaper story were equal to roughly a thirty-second ‘wrap’ on television. Come die with me any way you want, but not alone. Rain was a portable memory now, not an experience anymore. Delhi itself was restless, as if had it not been tethered to the power centre, it would have wandered away along any one of the national highways that crossed it. You shouldn’t say such things, makes me want to prove you wrong. It took time to realize it was her gift that separated her from the rest, the power to see the invariable truth all the time, without choice, without relief. It robbed her of her mirages, the necessary falsehoods required for happiness. And ironically, none of her special powers could tell her anything about the parents who had abandoned her or the reason for their decision. What’s the difference between blood and rain? One flows over the skin, the other under it. He chose his fictions, whereas she was assigned her truths. She watched the cement of the building indifferently receive the rain and channel it to the waiting drains. what I don’t have in mementoes, I make up in memories. And like an honourable person with a clear conscience, Delhi was very good at forgetting. She felt strangely insufficient without him, as if he was functionally important for her to get through a day. He carried his pain like a secret letter in his heart, folded between past and future, hidden in every sliver of time. ‘Love is for birds and garden benches,’ she whispered. ‘You think of it beautifully, with colours I have never known before, like looking through a magical glass at a new world. But it also shatters to pieces when I want it to be true.’ ‘Then try looking at it through my eyes,’ he suggested. If the words ring true and the incidents trigger a sense of déjà vu, please attribute them to my realistic imagination. I do not write to blame, I write to change. And I hope this is the season for it. It always is. Special Mention : Placing the epilogue after the author's note - I am not even sure I should mention this in my review, but I almost missed the important part! Mira as a character. And Salat. I would read more and more works of the author, just for the way she sways me with her words. The book needs tighter editing, considering the genre it belongs to. The politically correct ending dampened my excitement. How are her titles chosen? Sundari Venkatraman answers! RM: How do you choose your titles? 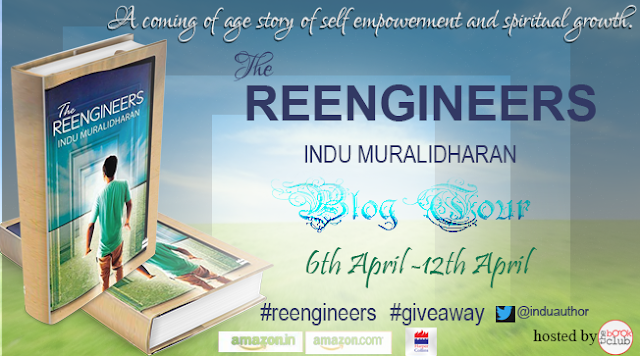 Thank you for giving me an opportunity to write a post on your blog for #AAFA promotions. The first 2-3 weren’t too difficult as The Malhotra Bride and Meghna just popped into my mind. I didn’t think twice as they were unique and had no competition on Google search. So, a search for this title also throws up only my book. Over a period, this became an important point when I choose the title – the uniqueness. Matches Made in Heaven is fairly common and I wish I had thought more before going with that as it’s a common phrase and oft-used. But then, I suppose one can’t win them all. 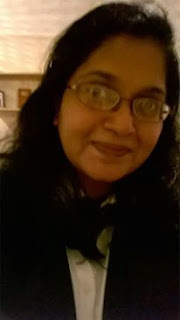 The Madras Affair – I was thrilled to zone in on this one, suggested by my publisher. I actually jumped at it. Madras is very close to my heart as I spent the first half of my life there. The title is oh-so-perfect for the book. An Autograph for Anjali is the result of a lot of thinking. I prefer to use proper nouns as they tend to be unique for one thing. I also prefer to use a title that’s essentially Indian. For that too, using the name of a protagonist is of great help. These are the criteria for how I land up with the titles that I have so far. HOW I GOT THIS BOOK: I thank the author for this copy. For an author who has penned many romance novels, so much so that she has become synonymous with powerful romances dealing with uncertain but strong willed women, Sundari's writings have always, always captured my imagination. The first book I read from her carousel, The Madras Affair, was one of my all time favorites. So I knew what to expect from this novel, and I finished it in one sitting. After all, the book is a fairly new entry in my collection. It arrived only yesterday. When I was offered this book for review, I grabbed the chance. I had read one previous work of the author, and half of another, before I got a chance to read her latest. Since her works stood well as standalones, I picked this up without hesitation and read it in one sitting. Jayant Mathur is found dead in his own bedroom. A maid servant finds his corpse and alerts everyone. His wife of twenty years, Anjali Mathur, finds little emotion within her at his death, except pity. Parth Bhardwaj, famous author and their neighbour, appears on scene and helps the bereaved family finish the formal investigative procedures and the deceased's last rites. Arjun Mathur, the only scion to incredibly wealthy Jayant Mathur, is studying in the UK and returns home on hearing the news. Jayant's parents, sisters and their spouses enter the house to find Anjali sans any tears and the mysterious Parth helping out more than a normal friend would. Doubts surface, aspersions are cast and before long, everyone comes under the police radar. Slightly miffed that his brother in law's immense wealth would go to a shrewy woman who did not even care to shed a phony tear, Rana tries his best to cast the tide of doubt towards her, deliberately pointing to the obvious closeness between the helpful Parth and the stony Anjali. A creative tale about Anjali's supposed affair turns tables and police are baffled. The story sets this wonderful premise and jumps six months back, giving more than enough background. When it came back to the present, the would be murder is solved and the case is closed. What surprised me in the story is the beginning. Having expected a romance with thriller element, it was slightly shocking to see that the book opened with a crime scene. I did wonder for a few minutes about where exactly the romance angle would creep up. The obvious answer came within the first few pages and from then on, the story follows a casual whodunit plot. Starting with Anjali's indifferent behaviour to Rana's deliberate misinformation to Parth's seething anger, the book had a lot of suspects to work with, each with their own strong enough motive. 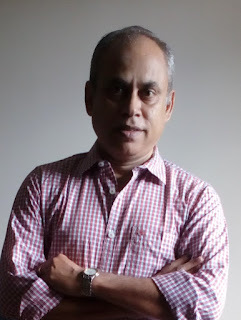 Jayant, for a character who was dead, invoked a strange sense of indignation in the woman in me, and I almost agreed with the treatment meted out to him by Anjali. Arjun, the son, was the one who captured my attention and made me wistful as to why good hearted people exist mostly in novels and stories. It is often parents who selflessly think about their children, but Arjun attracted the reader in me from his first appearance. The suspense of the killer's identity paralleled the suspense of the unexpected closeness of Arjun, Anjali and Parth. But halfway through, I did forget that Jayant was actually a dead man and I was reading a flashback. The chapters involved too many scenes and details that slackened the pace of the romantic thriller and I did guess the 'murderer' by the time I was reading a part of the flashback, taking my time after that to only pile up evidence supporting my theory. Maybe I read too many books of the thriller genre, or maybe my mind automatically zoned towards the right vs wrong conundrum because of the author's descriptive writing that gave away more than it concealed. Anjali and Arjun evoked the strongest reaction in me, and I could write the whole review praising these characters and the depth with which they have been penned. But focusing on the other aspects, the book needed tighter editing in its second half, the place where readers are prone to skim parts to get to the juicy areas where the real action happens. Keeping this part air tight would have made me more involved with the book. Other than the identity of the killer and the entertaining suspense, this book works well for fans of both genres, be it romance or thriller, though it does lean more towards the former. The book slacked a bit in the middle, picking up pace only after the 'trip'. The murderer's guilt was a bit overplayed, the emotions seemingly raw. 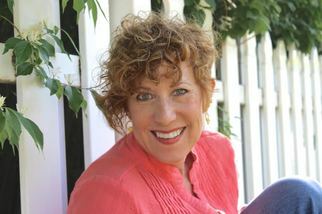 A thriller that starts with a murder and delves into a flashback, resurfacing as a romance. A dim yellow light in the background enabled the viewers to get a silhouette of the girl. Perhaps there was a fan beyond the camera frame that ruffled her curly hair mildly, and her hand moved involuntarily to put it back in order. The yellow line over the edges of her shoulder and arms implied a somewhat plump figure. She was wearing a sleeveless top or kurta. “Sesha had never stared at me like that. In fact, I doubt whether he had noticed me properly at all. He would enter the room and I would walk out. There was never a chance. But then, that night was perhaps different. He had always seen me in churidar-kurta. That night since I had gone to sleep, I waswearing a nightgown…a sleeveless one. “He asked if I could serve him dinner. The cook had left. She generally left for her home on Saturday evenings and returned the next night. I agreed. He returned to the dining table after changing. I had laid out the dinner. He then took out a bottle of red wine and poured two glasses. That was a surprise. I had never seen him taking alcohol. Perhaps his wife’s accident and her long illness had disturbed him emotionally. He offered me a glass. I hesitated. But he insisted. So as not to offend him, I took the glass and sipped the drink.” She seemed to move uncomfortably in her chair. Her voice choked. Catherine extended a glass of water and the girl’s hand extended from the hazy dark background. The fingers that wrapped the glass, which was outside the darkened area, were white and the nails were well manicured. She sipped the water, cleared her throat and resumed. Catherine handed the girl another glass of water. 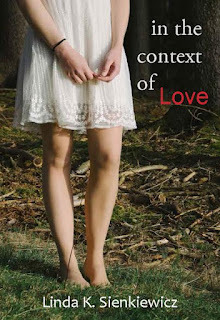 Joe Vadas, one of the main characters in In the Context of Love, comes of age in the seventies. He’s a big fan of Jim Morrison and The Doors. I’ll let you in on a secret: his obsession is actually my obsession. When I was a teen in the seventies, Morrison’s voice was like a conduit of love, passion and intensity, and his sudden death only deepened my fixation with him. His poetry and lyricism spoke to me on many levels — I understood and felt his confusion and disillusionment with life, and found solace in poetry, too. A few years ago, I visited his gravesite in Pere Lachaise Cemetery in Paris. I had brought a copy of my poetry chapbook, Dear Jim.The title poem speaks to how our obsessions can guide us through the dark times in our lives. Written on Jim’s gravestone is “Kata Ton Daimona Eaytoy,” which means “Faithful to his own spirit.” In ancient times, deities who distributed the fate and believed to be life changers were called daimones (daimons). The protector deity that lived inside a person from their birth till death, and took care of their personal evolution and prosperity was called “daimon eaytoy”. In my poem, I call on Jim to be a guardian angel. I really, really wanted to leave my book at his grave. Unfortunately his gravesite is fenced off, and climbing over it is an offense that could land you in jail. Avi, my tour guide, was a personable artist from the States. Feeling a kinship with him, I excitedly showed him the chapbook, hoping he might help me. “It wouldn’t be littering?” I asked. Avi shook his head and assured me it would be fine. Together, we walked up to the fence. “Just toss it,” he said. “I’ll be waiting over here.” He smiled as he backed away, as if to say I was on my own. My heart was pounding. I felt conspicuous among the other tourists, like a rabid fan, still the awkward teenage girl whose kohl-lined, bloodshot eyes saw Jim’s face in every Rorschach blot, who believed she alone could light his fire. I told myself I had to do this. I’d never forgive myself if I didn’t try. Hoping for the best, I flung it. To my delight, the book landed face up and close enough to Morrison’s grave for onlookers to know its intentions. Avi smiled hugely when he saw it. “That’s perfect. People can see the cover!” he said. And there it will stay. Maybe another fan who climbs the fence at night to leave flowers for Jim will move it closer. If not, that’s fine. The book will turn to dust, as everything and everyone we love eventually does. We will be remembered for our gestures, the things we leave behind, the dreams we share. Angelica is narrating the story. It sounds more like a letter she writes to her erstwhile boyfriend, a person who disappeared from her adoloscent life abruptly. But it does not begin like that. The story begins with Angelica taking her kids to see their father in prison, and has one of the best opening chapters ever in books I have read recently. The way she talked about her feelings right then made me connect with the narrator a bit, something I sadly lost as the novel progressed. The prose flowed smoothly, noticeably smooth enough to get my attention and appreciation. What struck me was how the characters were deeply etched, each having their own distinct shades, something that is really difficult to pull of in a novel written in one dimension. The language and prose follows a nice lilting tone. I liked the way the author takes the story forward, and how it is phrased. Even my hate towards the distasteful actions of the lead character are more of a reaction to her as a character rather than the narrative. Overall, a nicely written story that has a good prose, classic and smooth. I may not exactly like the direction the story took, but it sure attracted me in the way it was written. The whole story flowed smoothly, without unnecessary jumps and glitches. The drama and the heartache might not be some people's favorite. A good book that puts forward the story of a woman who gets a second chance. I have gotten so affected by shoddily written romances in recent times that I jump at a chance to pick up any book that is not of this genre. When I saw the blurb of this book, the thing that first struck me was how the plot was similar to some fantasy novels I had read. A troubled adoloscent and his friends get into a magical world via a portal and there starts their journey of self discovery and growing up as they simultaneously solve the problem of that alternate world too. 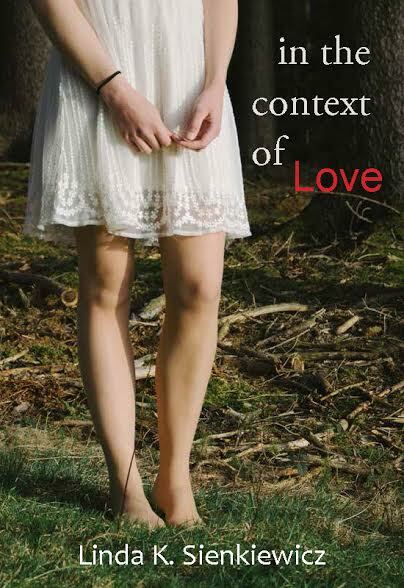 But the author has taken this simple generic theme to give a beautiful novel. From the first word, and the way it described Madras (hot, hotter, hottest, hell) and the way that obvious love for the city and its many features was shown indirectly, the book drew me in. The beginning dragged a bit, and lagged like the way certain late comers take time to get adjusted in a movie hall. But once everyone had settled down, the ride was worth it. The book has many characters, the central one being Chinmay. His journey as he meets life's various characters who each have a lesson for him (no, that's not as philosophical as it sounds) and how he dispels his sad thoughts and confusions or at least tries to, forms the rest of the story. What I liked best was the narration. Save a few inconspicuous errors, the book was a joy to read. The story is similar to many others I have read, at least in concept. the execution is widely different. I liked the book for what it was, a refreshing break from the run of the mill stories. My most favorite parts of the story are the beginning and the ending (and many places in between) but these were what gave the perfect place markers to the story. This book needs improvement in certain regard, and could do with tighter editing and slightly more engaging initial chapters. But once you get the groove, this book will not really allow you to put it down. This is not a racy page turner, but it makes the reader in me curious as to know what comes next, and that keeps the pages turning just as effectively. HOW I GOT THIS BOOK: The author sent me a kindle copy, and I profusely thank him for it. A hilarious pseudo-history of marketing management, which explicitly denies resemblance to any actual history, and which will be horrified if some semblance be found. The story of a man who discovered that the path of life is strewn with treadmills and, if you get on one by mistake, you could keep running all your life to stay in the same place. The story of how a businessman may just be minding his...err...business and the 'Invisible Hand' can cause unexpected consequences to arise out of his innocent actions. There is no point blaming the tale for being exaggerated because that is precisely what it seeks to be - an 'exaggeratio ad absurdum' of some facets of the world. Anything you learn from the book - be it the basics of marketing management or a satirical view of Society - you do at your own risk. The tale only dogs the doings of Spike Fortune who only sought to feed dogs and, later, sought more dogs to feed. 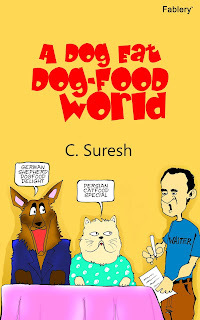 Jerry Fortune who, being fortuneless, gets dragged helter-skelter behind his uncle Spike in the latter's careening pursuit of commercial success and gets sandwiched between Spike and Tyke who was Spike's resident genius on enticing dogs with their wares. He also has to help Spike in his rivalry with Tom Rich, who is unwillingly dragged into upstaging Spike and tries to do it by teasing the palates of cats, helped by the bumbling efforts of Jasper Rich who would rather be partying than chasing cats with cat-foods. No matter how much I say I don't judge a book by its cover, I always look at how well it fits with the story. If a cover is intriguing enough, I pick it up and flip it over to read the blurb. But then, the blurb caught my attention too. When was the last time I saw a comic strip, a meaningful one at that, on the cover? The dialog bubbles conveyed everything I needed to know right then, and the confused 'human' standing there reflected many, if not all, of those poor souls who have no idea why they are doing whatever it is that they are doing. A book with an amusing title and grin worthy summary that claimed to be satire, and one that had an awesome cover? I was all set! Some books come along, rarely, very rarely, to increase your hopes that one day, the literary world would create, enjoy and cherish more such works. 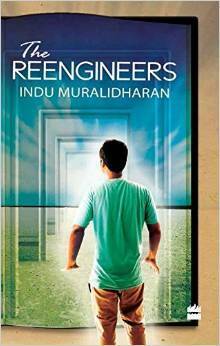 There are writers, then there are authors, there are favorites, and one among them is C. Suresh, after I have read this book. A Dog Eat Dog Food World, the name by itself being a twisted version of a much more famous saying (one that people keep repeating without much of an idea of what it actually means) confused me initially. But once I had read the first few pages and gotten the hang of the story, and the author's style of writing, it began to make perfect sense. There are dogs, and a dog food industry is created. There are cats, and a cat food industry is created. Marketing agents who find innovative ways to sell to people what they never needed, misled consumers who are swayed by words and trends rather than quality and need, and bored but egoistically clueless businessmen who set rules complete the picture. The book easily uses this simple scenario to explain, in detail, various 'marketing and industry milestones' that we would have otherwise read about only in boring annual reports and guide books of marketing consultants. Or perhaps one of the 'marketing made easy' or 'marketing for dummies' or probably the 'buy this book now to know why you should never do what others ask you to do' kind of manuals that would simplify marketing in easy to read hyphenated 43 letter words that would keep you so busy in memorising the abbreviations and combinations so you effectively forget the meaning - which was the initial purpose anyway. 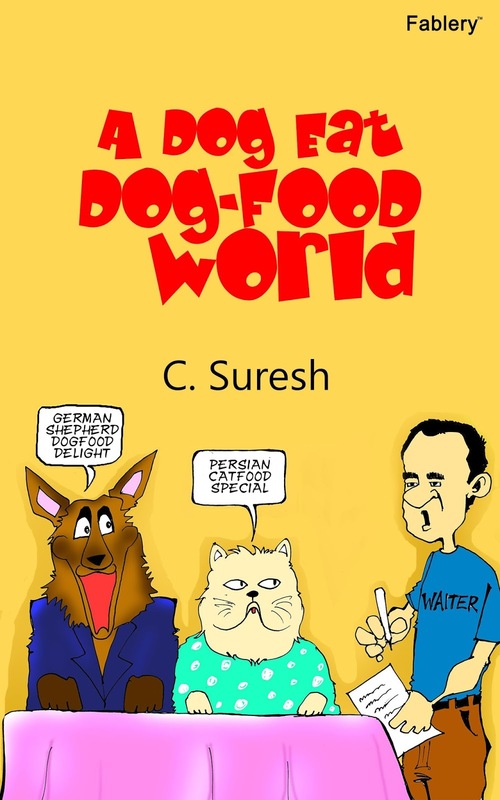 If you read the book as one about dogs and dog foods and cats and cat food, the underlying subtle humour goes right over your head. But if you keep aside the pet food rambling, and instead focus upon how this book clearly uses that cover up story to carefully construct the underlying concept, you will gain lessons for life. Pseudo history - semi fiction. It talks about real life concepts using a fictional example. This book could either give you hours of enjoyment and days of introspection, or clueless frustration based upon how you understand it. The book expects its readers to quit focusing on the superficial and instead get to the concept conveyed, which is a high bar considering its counterparts in the industry. Why would anyone read a book that takes satire to a whole new level and require concentration and understanding while there are other books out there, other 'entertaining' ones, vying for attention? Well, who would? Anyone in their right mind would. Anyone who is on the lookout for subtle humour and lack of crass jokes to induce laughs would pick this book up. You don't even need to be a marketing professional. This book is for everyone. No. I rephrase. This book is for everyone who can differentiate satire and sarcasm, This book is for everyone who has been waiting for a meaningful book that entertains and educates them. The reader's enjoyment of the book completely depends upon which type of humour they like. One that gives a few momentary hearty laughs and is gone like water through a sieve at the end of the day, or one that gives many reasons to grin, laugh, chuckle, chortle, snort, guffaw and gives a lot of content to take back and chew upon. Kudos to the author for trying this genre. There aren't many books in the humour category that makes us think and reflect too. I also appreciate his usage of dogs and cats. And I extend my best wishes for this book to gain name and fame beyond Jambudweepam and Bharata Khanda - something it is already in the process of doing. Because the language and the concept are both universal. Here are a few gems I would forever remember. It is a boon, sometimes, that the future is veiled from us. The fact that he had set into motion the wheels that would overturn the world would not have weighed so hard on his mind, even had he known of it. How true it is that we are able to bear the misfortunes of other people with unbelievable fortitude! When Fate is sneaking behind you and taking aim at the back of your head with a sandbag, it stealthily ensures that no cloud mars your horizon to warn you of danger. ...the sight was much like seeing the reclining Venus uproot herself from a Botticelli painting and start preparations for running a marathon. “Jerry! Jerry! Jerry! Come! Come! Come!” said Spike. A whirling dervish equipped with an in-built echo! It is amazing how much the way the world looks depends upon the mood of the viewer. Jerry had struck upon the most important management lesson – that the appearance of effort was more important than effort. having friends, who were too loyal, was more of a problem than having enemies. It was impossible to live life the way you want to, when you have concerned friends and disdainful foes both pushing you in the same direction. hopping and cursing in language unfit for mixed company, and the ‘foot-rug’ emitting blood-curdling battle cries, it was some time before normalcy was established. Oh! Ye of little faith! Having seen but the sapling that sprouted from the acorn, you dare question the mightiness of the oak that shall result? People willingly pay for wisdom when they would only sneer at common sense. The invisible hand has writ and, having writ, moved on. Maybe the standard of humour was too high? It might offend those it is obviously directed at. That not being the intent / purpose. RATING: 5/5 A Well deserved 5, that makes me yearn for more such books to be written.